After being made redundant in 2005 Roland Sergeant decided it was time to “pick up the brush” from where he had left off a number of years earlier and became a self-employed painter. Working out of a small van with the basic tools of the trade for a “one man band” this soon progressed into the need to expand and to take on staff. As the word spread that he was back on the painting market, Roland has since formed a company and now employs between 4-6 full time staff at any one time. His experience in the industry is over 40 years and his two senior painters each have a minimum of 15 years in the industry. It is safe to say that Sergeant Painters have the experience, knowledge and skills to ensure you get a quality paint job. 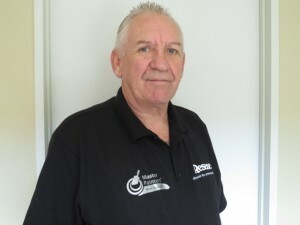 As a Registered Master Painter Roland has a “hands on” approach and is right there for you. Unlike the bigger companies where you can often feel like a number, this approach allows him to keep across quality control and communication. Sergeant Painters are here for your convenience. Our customers have told us we are very easy to deal with. We will recommend the right products for your paint job. For the best results, always work with a Master Painter! Look after your investment, by choosing to work with a member of the Master Painters Association. Thorough preparation is the key to a paint job that will last, saving you time and money in the long run. All of our workers operate under the umbrella of the Master Painters Association. This is your guarantee that you are getting a thorough job – the preparation has been carried out to a Tradesman standard and the finish is high quality. We represent quality and will go the extra mile and do the little things that matter. Examples of us going the extra mile is, we will vacuum up after ourselves, on occasions we have cleaned the windows and put fresh bark into the gardens. Over time we have developed solid relationships with various paint suppliers which allows us to keep our material costs low, which we pass on to our customers. Its easy to make the mistake of bringing home numerous test pots of paint, only to find you have confused yourself and struggling to make a decision. Well now you don’t need to worry as we also offer a Free Colour Consulting service with Karina Atkins. She listens, cares and is passionate about helping you achieve your vision. Contact us today at Sergeant Painters for an obligation free quote.